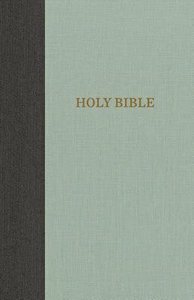 About "KJV Thinline Bible Large Print Gray/Green (Red Letter Edition)"
The Thomas Nelson KJV Thinline Large Print Bible-featuring the timeless beauty of the trustworthy King James translation in a large, readable font size-strikes the perfect balance between portability and readability. Wherever you're going, the KJV Thinline Large Print Bible is built to travel with you. This easy-to-carry Bible comes with features that will enhance your reading experience, including beautifully-designed covers, an all-new typesetting in the elegant and readable Thomas Nelson KJV font, double ribbon markers, and the words of Christ in red.